The original Boggs Spokeshave is hefty and solid, weighing 12 oz. 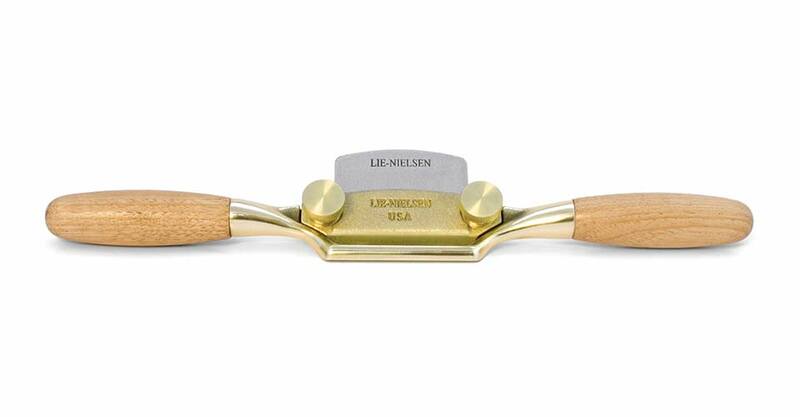 Designed for fine, precise shaping in all woods. Available with either a flat or curved sole. Body is 10" long with a 1" wide flat sole. 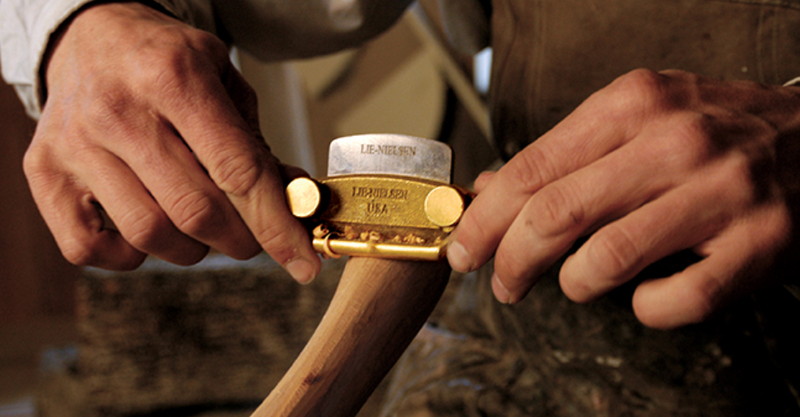 The sole of the Curved Spokeshave has a gentle, 5" radius for working inside curves. 2" wide x 1/8" thick A2 blade. A collaboration between Master Chair Maker Brian Boggs and Lie-Nielsen Toolworks. A 2-5/8" diameter sole makes the Boggs Concave Spokeshave the right choice for working chair spindles and other round parts. A2 blade is 1-1/8" wide x 1/8" thick. This tool is set up to take thin shavings (maximum .008-.010" or so). A tool with a large mouth will not perform as well on finish cuts. If you need a heavier cut, the tool can be easily modified by filing a chamfer on the leading edge of the mouth to allow a bigger shaving to pass. The blade has a 25° bevel and is bedded at 40° to the sole, bevel down. The easiest way to adjust the depth of cut is to lay the sole on a flat wood surface, loosen the cap and advance the blade until it touches the wood evenly. Tighten the cap screw. This should produce a thin shaving. If not, or if more cut is desired, either repeat with a paper shim under the front edge of the sole, or tap the back of the blade gently with a small hammer. The approximately 5" radius on the curved sole is intended for inside curves. The sole can be modified by the user for tighter radii. If you have any concern that the curved spokeshave you received has a flat sole instead of a curved sole, please check the sole with the edge of a straight edge. The radius on the sole of the Boggs Curved Spokeshave is approximately 5". A gentle radius like this works very well for curves as small as 10" in diameter. 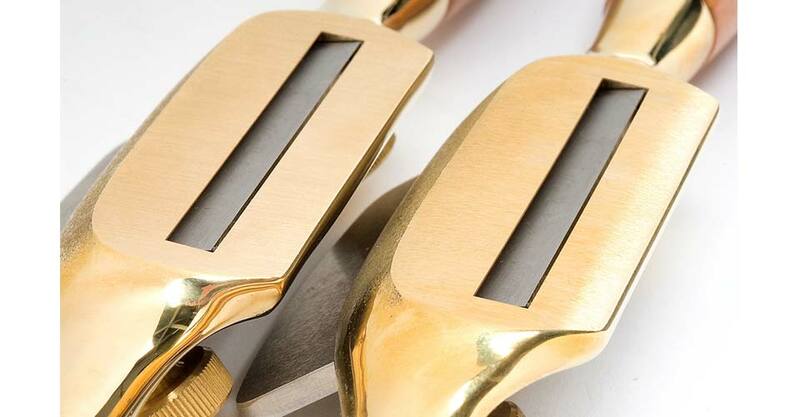 If you need to work a radius smaller than 5", please consider our Small Bronze Spokeshave, which has a 1 ½" radius. Manganese Bronze body and cap, Brass thumbscrew. Heartwood Hickory handles. The blade is A-2 Tool Steel hardened to Rockwell 60-62, cryogenically treated and double tempered. Our heat treating technique ensures that the blade will take and hold a very fine edge for a long time. After heat treating, the blade is fully surface ground on the top, back, and cutting edge, giving a smooth, flat surface that will take a mirror finish very quickly. Polish the Bronze parts with any good brass polish or enjoy the patina that develops with age and use. Oil the blade to prevent rust. We recommend Camellia or Jojoba Oil - vegetable oil based products. They are non-toxic, odor-free and easy to use. A 2 5/8" diameter sole makes this tool the right choice for working chair spindles and other round parts. The blade has a 25° bevel and is bedded at 40° to the sole, bevel down. This tool is set up to take thin shavings (maximum .008-.010" or so). A tool with a large mouth will not perform as well on finish cuts. If you need a heavier cut, the tool can be easily modified by filing a chamfer on the leading edge of the mouth to allow a bigger shaving to pass. Use the spokeshave to work a 1½" piece of wood to a radius that matches the blade when the blade is held at 25º to its surface (the angle of the bevel). Glue sandpaper or microfilm to the wood and use to hone the blade. Make several pieces for different grits. Use with diamond paste or honing compounds for the best edge. Hone the back of the blade as usual. Set the blade by eye; sight down the sole and look for the dark line of the projecting blade. Make adjustments with a small hammer. The corners of the blade are meant to be flush with the sole when the blade is set to take a thickish shaving. Manganese Bronze body and cap, Brass thumbscrew. Heartwood Hickory handles. The blade is A-2 Tool Steel hardened to Rockwell 60-62, cryogenically treated and double tempered. Our heat-treating technique ensures that the blade will take and hold a very fine edge for a long time. After heat-treating, the blade is fully surface ground on the top, back, and cutting edge, giving a smooth, flat surface that will take a mirror finish very quickly.